Wazala! is a new web-based storefront created by some clever folks in Los Angeles. One of the key benefits to Wazala! is your web store is optimized for the web as well as for mobile devices. According to the Wazala! website, you can set up your site in 15 minutes. 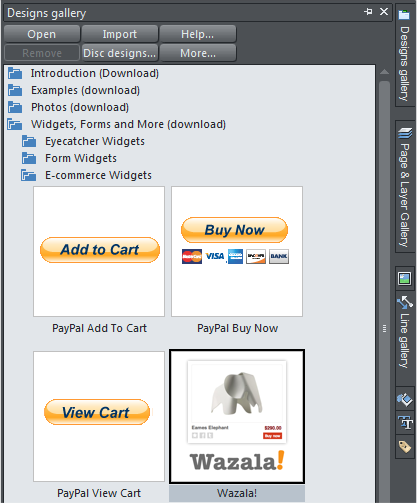 The free version appears in a separate floating window. 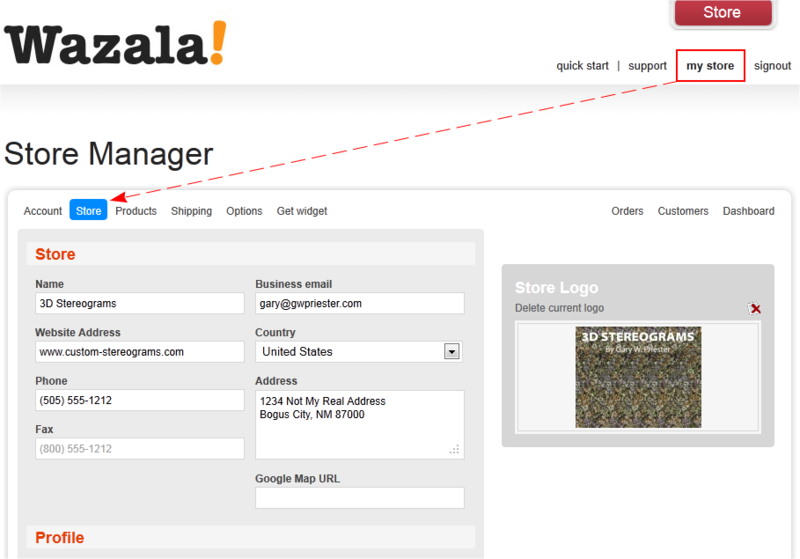 With the paid accounts you can also embed/integrate the shop into your actual web page. 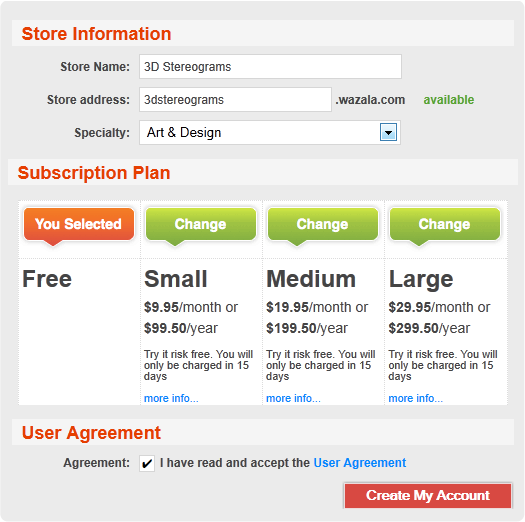 You can see sample e-commerce sites here, and you can check out the pricing plans here. In addition there is a FREE store option here, but you are limited to 5 items maximum and there are other restrictions. But it’s a good way to get our feet wet and so we’ll explore this option. The first thing required, and this is true of all the e-commerce solutions, is you have to register. You can register for a 15 day trial for any of their three paid plans, or you can get a free subscription. You can always upgrade to a paid account later if you wish. I’ve taken the first step and gone to the Signup page. 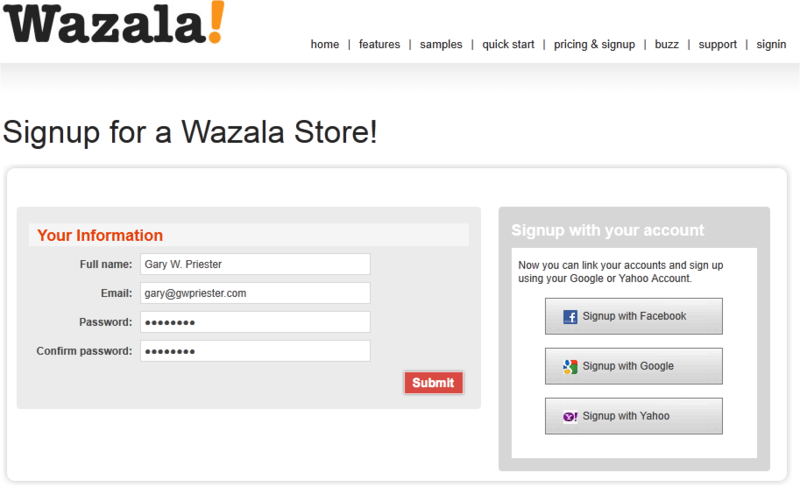 Note that you can also sign up with your Facebook, Google or Yahoo log on information. I’m about to commit to the Free plan. I am calling my store 3D Stereograms. My store web address will be 3dstereograms.wazala.com. Not sure what this means, but I am sure all will be revealed in 15 minutes or less! The green text available indicates that this address is not in use by another member. And I have specified my specialty as Art & Design as I will be once again, offering my excellent stereogram prints to the world. (Remember my prints are not really for sale). NOTE: Do not use dashes or any other punctuation for the store address because it will appear as Taken. Your guess is as good as mine as to why this is. But you have been warned. After you check the Agreement option check box and press Create My Account you will be advised to expect an e-mail confirming your e-mail address. When you receive the e-mail, click on the link and you’re good to go. You also will have the opportunity to link your storefront to your Facebook, Google, and/or Yahoo account. The next step is to drag the Wazala! widget from the Designs Gallery onto the page and sign in to our (your) new account and see what exciting things await us (you). Are you ready? OK I just did this and basically you get to your account page and there is some introductory information. But this is not getting my Stereograms into my gallery. And right now my free on-line story is EMPTY and my 15 minute setup count down clock is ticking! So... I clicked the my store link in the upper right and then clicked the Store tab. I have uploaded my Store Logo and entered some information. You can also add a store background color, or a background image, a link to a Google Map, and various information relating to your store. Do add real information, and not bogus information like mine. OK? I have added my first item for sale by clicking Products and then New. The options shown in blue text at the bottom are only available if you sign up for a paid account. 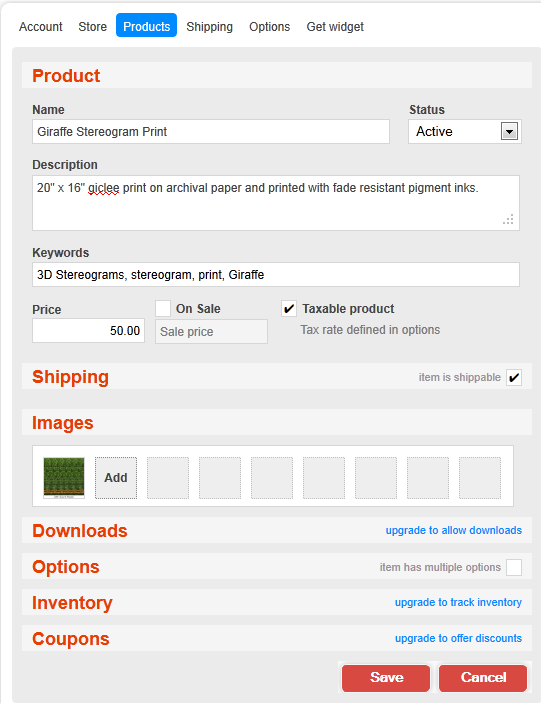 Click Save and then you can add your next item. (Continued on the next page >).